The physician told her to return tomorrow. ‘An affliction of the heart,’ was all he said. She returned fearing the worst. 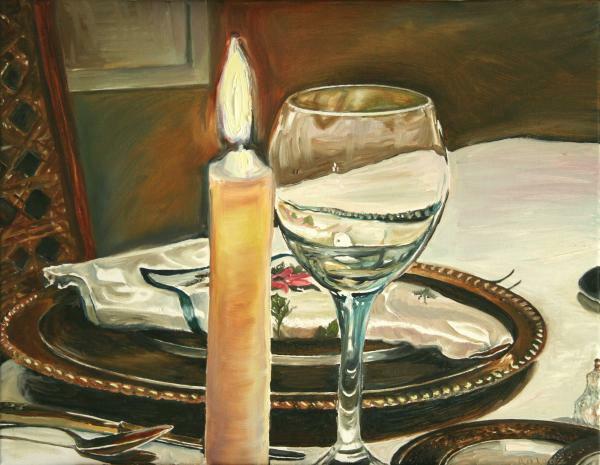 She entered the little cabinet and saw on the desk a fine dinner and red wine and two lit candles. The doctor, neatly dressed, held a bouquet of roses. Is Isolation Good For an Artist? that’s an interesting doctor patient relationship! Professionalism comes first. Almost always. Not too surprising, my “thecontradictoryoptimist,” coming from the writer of a recent 50 word story of the relationship between a nephew and his aunt – although, like yourself, I would think twice before going. A heart doctor with an side interest in gastro? I don’t think there’s much queerness in this story, Randy. As to that other story, well… Vargas Llosa married his aunt Julia when he was only 19. You can say about him whatever you like, I don’t mind. I’m not his fan. Just said that about his aunt as a curiosity. I tip my hat to you Randy. I like your comments. oh my goodness, i just loooooooove this with all my heart. I used to kiss my hot chiropractor in the office when the door was shut. I hope it was a kiss on the cheek and nothing more. Kissing is such a messy business! There is a similar story told as Sufi lore. The doctor asks the writer to recite his/her latest poem, after which the writer is healed. The doctor tells the writer the sickness was from not releasing his/her poem. It was said much more eloquently than this! Yes, it might have happened. Life brings more romance stories than there are writers to write about them. Yes, what do you make of it? An affliction of the heart indeed =) nice one! I love this. I really do. I may have to do one! Now you have my head in the clouds, dear hatted boy. And do you perceive any heart-shaped clouds? I do! And did you see my heart-shaped cactus?